Lou Holcomb, founder and President of Diamond Recruiting, has over 25 years of experience in baseball. As a youth player in the Greater Glen Burnie Organization, he developed his skills and was chosen to play varsity baseball at Old Mill High School in his freshman year. Lou started for the Old Mill Patriots as a sophomore, junior, and senior. He was named to both the All-Anne Arundel County team and the Baltimore Sun’s All Baltimore Metropolitan team for three consecutive years. In his senior year, he was named the Maryland State Player of the Year, 1985. Lou was recruited by over 40 colleges during his prep career including: Notre Dame University, Clemson University, University of Arizona, University of Alabama, Vanderbilt University, University of South Carolina, United States Naval Academy, United States Military Academy, Old Dominion University, University of North Carolina at Chapel Hill, University of North Carolina State, Georgia Tech. University, University of South Florida, Columbia University, Princeton University, Oklahoma State University, George Washington University, University of North Carolina at Charlotte, University of Kentucky, among others. But it had always been Lou’s dream to play for the University of Maryland Terrapins. He selected the Terrapins and was awarded a full scholarship to attend College Park. Between Lou’s prep and college baseball playing days, he was fortunate to have played for five summers (tying a franchise record) for the nationally recognized summer team, Johnny’s of Baltimore, led by late super scout Walter Youse. At age 16, Lou was one of the youngest to have played for Youse. Johnny’s of Baltimore won two All-American Amateur Athletic Baseball Association National Championships during Lou’s playing career. At the University of Maryland, Lou broke the freshman hitting record for Number of Hits for a First-Year Terp, hitting .387 his freshman year. He played outfield, first base and pitched for Maryland. Lou was a four-year letterman and was Team Captain in his senior year. He was named to the All-Metro team as a junior and senior for the Terps and was the school’s first All-Atlantic Coast Conference Player of the Week. Lou’s pitching at the University of Maryland brought a professional contract his way. 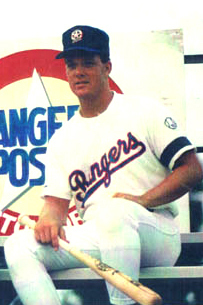 He signed with the Texas Rangers in 1989.Lou played in the Gulf Coast Rookie League for the Rangers in Port Charlotte, Florida. He was later was elevated to A level at Gastonia, North Carolina, in the South Atlantic League. Due to an injury to his pitching shoulder, he was given his unconditional release in spring training the following year from the Rangers. Lou was fortunate to have played with Texas’s budding young stars at the time: Ivan Rodriguez, Robbie Nen and Juan Gonzales. As a high school coach, Lou took command of the Cardinal Gibbons High School baseball program that was struggling with a 4-18 record. Lou’s talents helped turn the Crusaders around and led them to a Maryland Interscholastic Athletic Association (MIAA) conference championship in 1999, and another conference title in 2000. The Crusaders were 72-40 in his four years of coaching. He was awarded the Baltimore Sun’s High School Coach of Year for his team’s success in 1999. Lou was the driving force in returning Cardinal Gibbon’s baseball to the highly competitive MIAA “A” Conference, where they compete currently. As a coach at Cardinal Gibbons, Lou stressed the importance of academics and higher education to his players, and he helped several of his players earn baseball scholarships. Lou currently serves as an Associate Scout in professional baseball and is a member of the Mid-Atlantic Major League Baseball Scouts Association. For over a decade, he has been responsible for seeking out high school and college baseball talent in the Baltimore area. While assisting his players at Cardinal Gibbons in their quest to play college baseball and earn scholarships, Lou recognized the need for families to have someone work on their behalf in the college recruiting process. Acting as an advisor in the process, he eased the burden on families by ensuring their sons were evaluated and considered by numerous college baseball coaches. Lou realized this need existed far beyond the walls of Cardinal Gibbons, and he established Diamond Recruiting in 2003. Since the company’s founding, Lou has helped many players achieve their dream of playing college baseball. In 2014, Lou was named to the state of Maryland's All-Decade Team for the 1980's by Pressbox Magazine and is a member of the Old Mill High School Hall of Fame.